My son has always suffered from frequent and severe nose bleeds, which was only an inconvenience until he started school. After my son entered school, the nose bleeds become a serious problem because each time one would occur the school would send him home, which resulted in him missing numerous days of school to the point where he began falling behind academically. We were desperate for help and after seeing a specialist we learned many tips that greatly reduce the occurrences and severity of the nose bleeds. To prevent the nose bleeds, moisture is essential for preventing the nose from drying out. There are many simple changes you can make to help keep your child's nose moisturized. Cool mist humidifiers are vital for preventing nasal dryness. Never use a humidifier that emits heat because, although it is moisture, it is warm moisture, which will result in dryness. Keep a cool mist humidifier in your child's room and anywhere else they spend a lot of their time. It is especially important the humidifier is used at night while the child is sleeping. 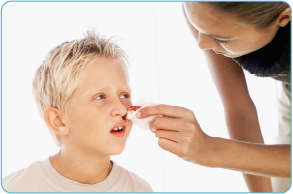 Saline nasal spray is also vital if your preschooler suffers from severe nose bleeds. Saline spray will help keep the nose moisturized, while relieving congestion that may come from the nose bleeds. The saline spray should be used at least 3 times a day: once before school, when they come home from school, and before bed at night. A consultation from a doctor will tell you how many times per day your child will benefit from the saline spray because each child's situation is unique. Another little trick I learned was to place a small amount of polysporine inside my child's nose at before bed. It will keep the nose from drying out at night and help heal their already dry nose. Simply place a small amount on a Q-tip and run it on the very tip of the inside of the child's nostrils. Eliminate Triggers Severe nose bleeds are often triggered by an environmental irritation. In my son's case, his nose bleeds are triggered from environmental allergens and dry air. To prevent nose bleeds caused from allergies, eliminate any allergens your child is around as best as possible. If your child is allergic to pets, the pets are going to have to find a new home. If their allergies are triggered by pollen, an allergy medicine is essential. There are many over the counter allergy medicines that can be used, or your child's physician can prescribe a medication for them. Does your child have frequent nose bleeds? What tips have you found to be useful?